The Jim and Sallie Hogg Honeymoon Cottage is located in the Governor Jim Hogg Park in Quitman, Texas, which was the first home of Governor and Sallie Hogg (Sarah Ann Leannah Stinson). Americans might not know the names of many governors from states other than their own, especially not from decades ago, but Governor James Stephen “Big Jim” Hogg (March 24, 1851 – March 3, 1906) of Texas could be an exception. Hogg was known to be a great governor, but non-Texans might recognize his name from the name he gave his only daughter: Ima. Some joked that he had a second daughter named Ura, but Ima had only brothers, who had ordinary names — Will, Mike and Tom. Ima’s name was taken from The Fate of Marvin, an epic poem written by her uncle Thomas Hogg. Ima (July 10, 1882 – August 19, 1975) didn’t like her name, and had no middle name, so she often used only her first initial. As soon as he heard of his new granddaughter’s odd name, Ima’s maternal grandfather raced to his son-in-law’s house to protest, but Ima had already been christened. She never married and kept her last name until she died. Ima Hogg, around 1900, from Wikipedia. Ima was known as “The First Lady of Texas.” She was an American society leader, philanthropist, patron and collector of the arts, and one of the most respected women in Texas during the 20th century, Her father was a lawyer, state attorney general and the 20th Governor of Texas. He was the first Texas governor to have been born in Texas and was governor from 1891 to 1895. I first thought of writing about Jim Hogg when I saw a highway named after him near Tyler, Texas, which I often visit. Other places in Texas are named for him, too. Jim Hogg County in southern Texas is named after him. There is a Jim Hogg Historic Site near Rusk, Hogg’s birthplace. Governor Jim Hogg became his political career in Wood County, a county located in the U.S. state of Texas. As of the 2010 census, the population was 41,964. Its county seat is Quitman. The county was named for George T. Wood, governor of Texas from 1847 to 1849. Wood County Courthouse, Quitman, Texas. About Ima Hogg of Texas. About Texas Governor Jim Hogg. About Governor Jim Hogg Park in Quitman, Texas. Jim Hogg Historic Site, Rusk, Texas. About The Jim Hogg Highway, near Mineola, Texas. Another famous name associated with Quitman, Texas, is the actress Sissy Spacek, who was born in the town and has a street there named after her. A street in Quitman, Texas, is named for the actress Sissy Spacek, a native of the town. Click on any thumbnail to see a larger size of the photo. The Jim and Sallie Hogg Honeymoon Cottage is located in the Governor Jim Hogg Park, which was the first home of Governor and Sallie Hogg (Sarah Ann Leannah Stinson). A sign honors James Stephen Hogg, a Texas statesman, whose nationally acclaimed public career began at this site — the Wood County Courthouse in Quitman, Texas. Wood County is a county located in the U.S. state of Texas. As of the 2010 census, the population was 41,964. Its county seat is Quitman. The county was named for George T. Wood, governor of Texas from 1847 to 1849. I first saw a Valentine Diner at the Classical Gas Museum in Embudo, New Mexico. The museum, in the Rio Grande River Valley, is a collection of antique gas pumps, neon signs, soda machines, oil cans, vintage trucks and cars, plus plenty of other items. I grew up in the Wichita, Kansas, area but it wasn’t until I visited a museum in New Mexico a couple of years ago that I found out about a hometown industry — the Valentine Diner. My family moved to the Wichita area because of its biggest manufacturing business — airplanes — but somehow I missed this smaller manufacturing cousin. The diners were manufactured in Wichita by Valentine Manufacturing, Inc., from the late 1930s into the mid-1970s. Sales of the buildings expanded nationwide, and soon Valentine diners were installed all over the United States. About 2,200 of the portable diners, in a wide range of sizes. Some served only a handful of customers, while the double deluxe versions were as large as many restaurants with added areas that featured several booths, tables and a long counter with stools. Menu of Terry’s Diner, which has maintained the sign and location of Brint’s Diner in an historic Valentine diner building in Wichita, Kansas. One Valentine diner still serving delicious meals is Brint’s Diner in Wichita, where my mother and I enjoyed a meal. 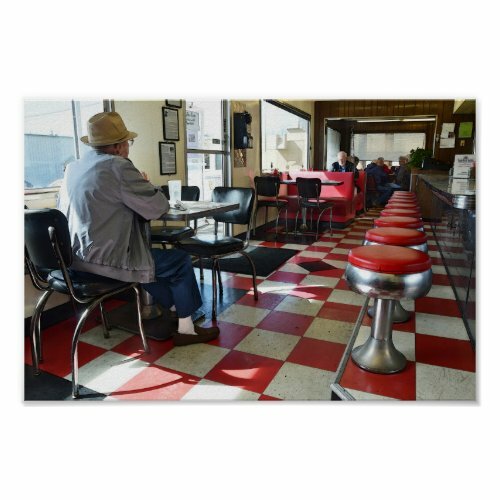 The red and white checkered linoleum tile floor, the red vinyl booths and bar stools and the aluminum trimmed interior provide a delightful vintage atmosphere. The diner attracts a loyal following. The Brint’s building is a double deluxe model. The diner concept was based on railroad dining cars, but with a parking lot and the addition of porches and other extras they settled in as permanent residents of their neighborhoods. The Grinder Man sandwich shop in Wichita, Kansas, is an A-frame model of a Valentine Diner. This Valentine Diner building in Wichita, Kansas, formerly a Lil Joe’s Dyne-Quik, is now closed. Sign says that the building was closed due to unsafe conditions. Brint’s Diner (actually Terry’s Diner) in Wichita, Kansas, is a Double Deluxe model of a Valentine Diner building. Valentine Diners Along Route 66 and Beyond.